I know I am a late comer when it comes to the Downton Abbey TV drama series that lasted from 2010 to 2015. I have tried watching it before and I remember the first few scenes quite well about the death of the heirs in the sinking of the Titanic, and an introduction to the parallel lives of the family and their whole horde of maids, butler, valet and footmen. I am now midway through its second season in iFlix and I am seriously hooked. I do not have any favourite characters at the moment, but I have one character I love to hate, Sarah O'Brien, brilliantly portrayed by Siobhan Finneran. 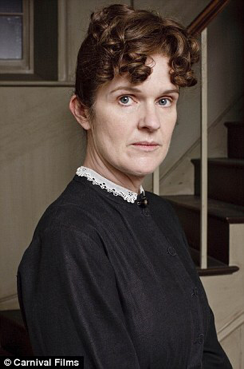 I find that the characters in Downton Abbey are all very, very interesting, very well played and well developed. Everyone of them tells a story. And I find O'Brien's character very interesting indeed. You would call her a baddie but there are so many layers that you can see in her. She is loyal but yet selfish, clever but conniving, hardworking but calculating. And so far she keeps getting away with all her ill-doing. I think she will be around for three seasons but she has already caused so much trouble, and not for herself but for others. It's interesting that she does feel guilty about what she does to protect herself but she does not seem to learn from it. I suppose people who are self-centered, those who do not not have a single cell of benevolence in their hearts will not see that they need to do anything good to others but to do whatever it takes to benefit and protect themselves. But it's fortunate that such people will not be able to continue like that for too long. Great story, writing, cinematography, characters and acting. Also an interesting take on the history of that time. I totally agree with you. Great set of actors with fabulous acting and a good story.